I have made a lightened-up version of Potato Salad for over 20 years. Replacing some of the mayonnaise with yogurt reduces the fat and calories quite a bit. That means I can enjoy a larger portion of Potato Salad! 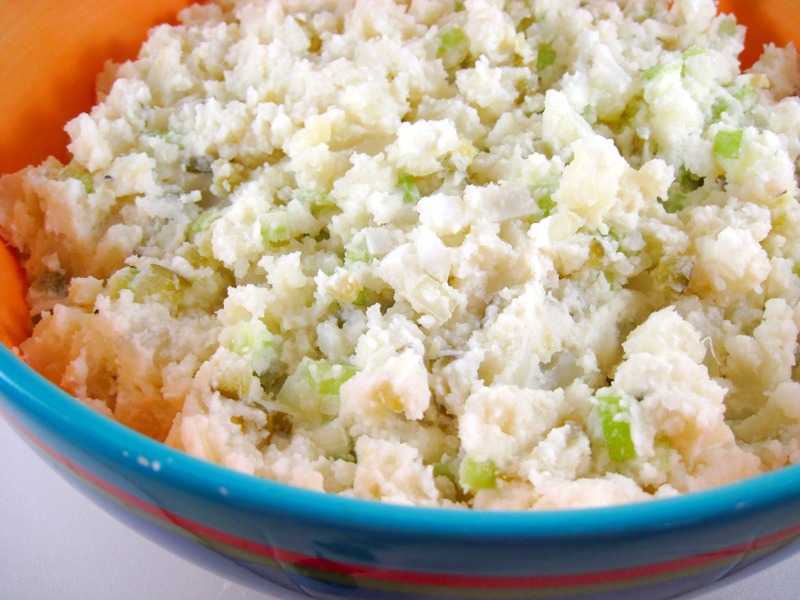 This potato salad is quite similar to the one my mom made. So to me, this is the “classic” Potato Salad. Mom most often used russet potatoes. And, yes, they will fall apart and not be in neat little cubes. That’s the way this one is supposed to be. One little trick that I like to do is to pour dill pickle juice over the hot potatoes. The hot potatoes absorb a lot of flavor before anything else is added. If you don’t want to use pickles or pickle juice, you can achieve a similar result by pouring a bit of vinaigrette over the hot potatoes. Use one that’s made with white vinegar (instead of red wine or balsamic) so the potatoes won’t darken. I have sometimes used a commercial nonfat Italian dressing; it adds flavor without adding any more fat. I like to add chopped hard boiled eggs to the Potato Salad. Thinking that one of our guests (that would be you, Byron) didn’t like egg yolks, I carefully removed the yolks and just added the egg whites. As it turns out, I was mistaken. He does like hard boiled egg yolks. Next time I’ll add the whole eggs! There is one thing you should know about using a yogurt-based dressing. 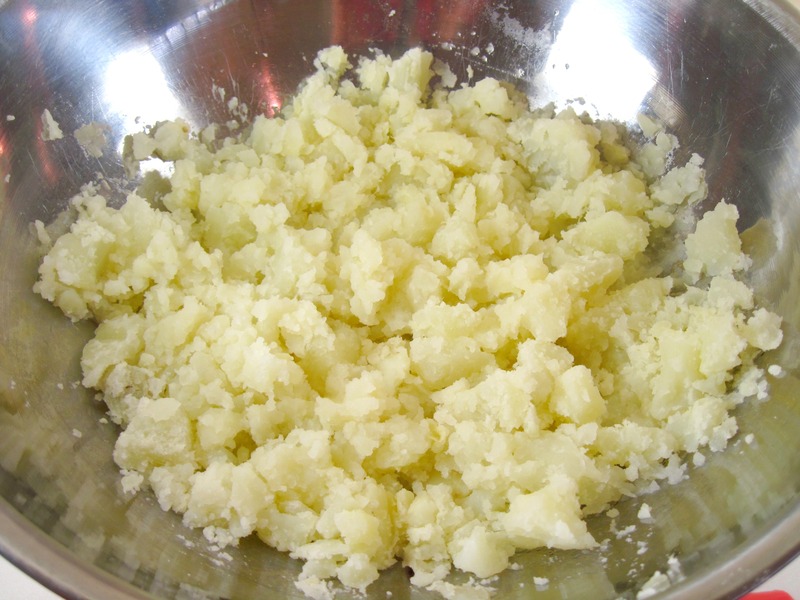 If you make the Potato Salad ahead of time, it will absorb a lot of the dressing and may be a bit dry. I mixed the Potato Salad ahead of time with about 2/3 of the dressing. I reserved the rest. Just before serving, I added a bit more mayonnaise and pickle juice to the reserved dressing and mixed it with the Potato Salad. I find that this method works great! In case you haven’t figured it out by now, this recipe is very flexible. Like my Twice Baked Potatoes, I probably haven’t made Potato Salad exactly the same way twice. So use this as a guideline. Make adjustments to make it just the way you want it. 1. Scrub the potatoes. Put them in a pot and cover with water. 2. Bring to a boil. Turn the heat down and simmer until done. 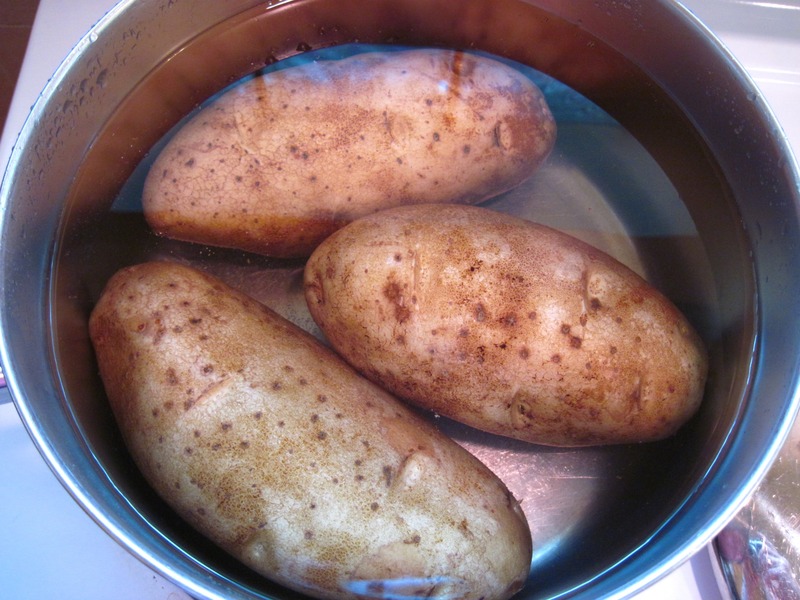 Depending on the size of the potatoes, it should take about 20 – 30 minutes, or until a knife slips easily into them. 3. Drain the potatoes. Remove the skin and put the potatoes in a large bowl. Using a dinner knife, cut the potatoes in the bowl into chunks. 4. 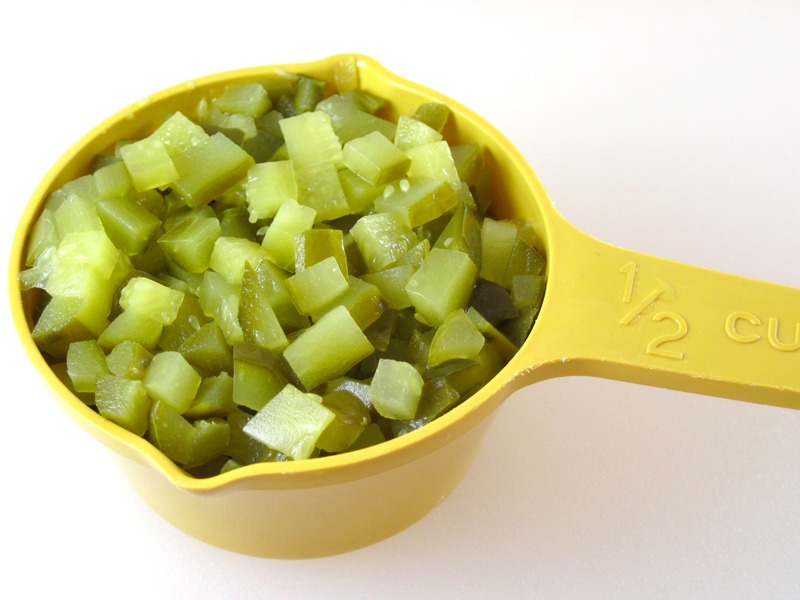 Pour 4 tablespoons of pickle juice over the hot potatoes and toss gently. Set aside to cool. 5. 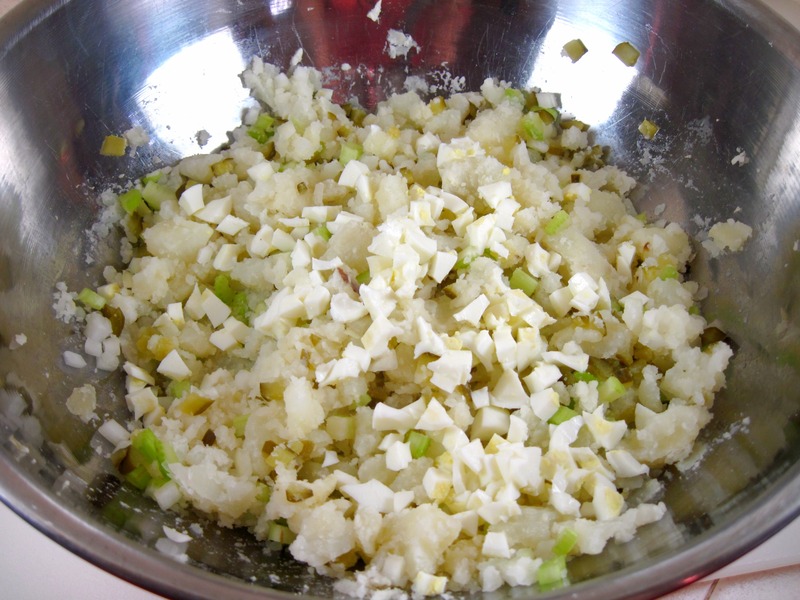 When the potatoes are cool, add the chopped onion, celery, pickles and eggs. 6. 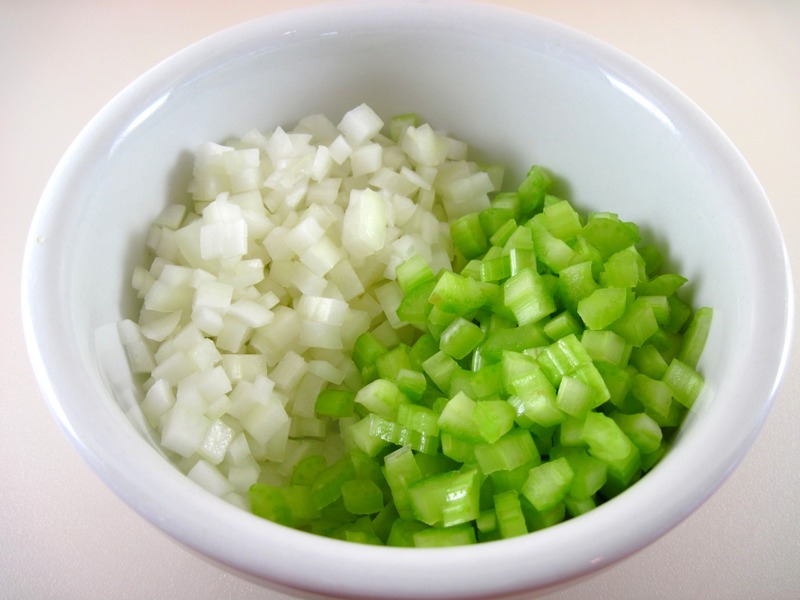 Whisk the dressing ingredients together. Pour about 2/3 of the dressing over the potato salad and gently mix. 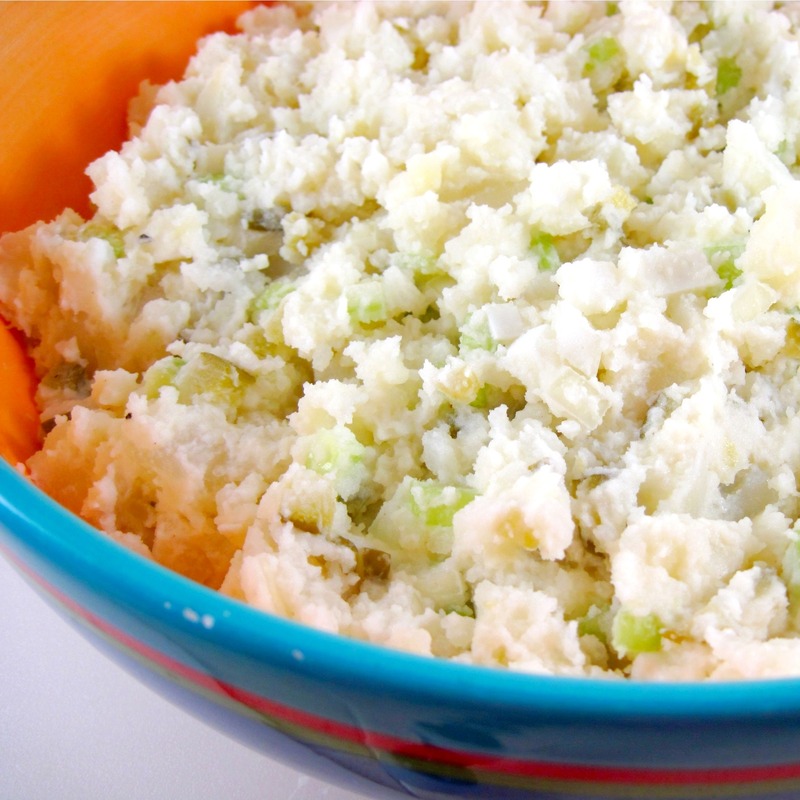 Refrigerate the rest of the dressing; cover and refrigerate the potato salad until ready to serve. 7. At serving time, whisk the 2 tablespoons of mayonnaise and 2 tablespoons of pickle juice into the remaining dressing. 8. Add as much of the extra dressing as you feel it needs to make the potato salad the way you want it. Taste, and add salt and pepper, if needed. A little sprinkle of paprika would be nice, but I was out. I love the pickle juice tip! Every family has a different take. 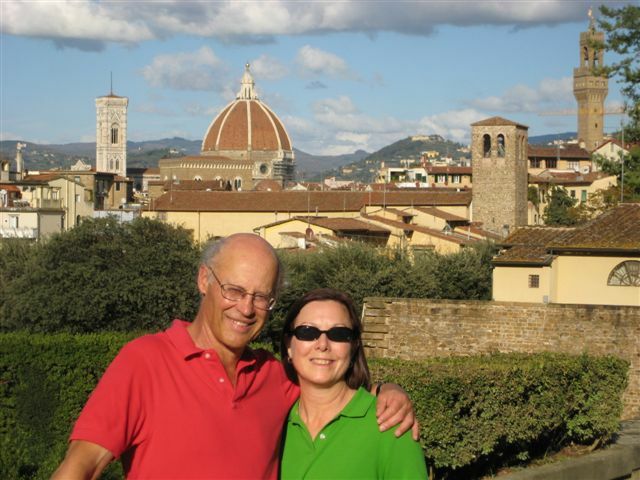 I was recently revisiting an old post of mine on just that: http://eliotseats.com/?p=453 Your pics are amazing. Love the pickle juice tip… great idea. Great recipe. Love potatoes. I ❤ the pickle juice idea. I'm one of those people who drink the pickle juice straight from the container.